Commentary: Do You or Don’t You Support Deasy? Monica Ratliff, a lawyer and elementary teacher, demurred, saying she is “hesitant to evaluate someone’s job performance based on articles I’ve read,” and would “need to know more” before evaluating him. All three of these candidates have been endorsed by the teachers union, which has been deeply critical of Deasy. But some candidates are having a hard time giving “The Supe” a clear thumbs up or down. Why? 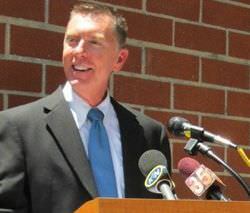 John Deasy was hired by the current School Board almost two years ago as a passionate but practical reformer who vowed to transform the troubled district by raising achievement, focusing on results, and putting students’ needs first. True to his word, he has pushed hard. He designed a groundbreaking performance measurement that relies on an array of measures — not just test scores — called Academic Growth Over Time, only to have it rejected by the teachers union as a measure of teacher performance. He took heat for acting swiftly after the Miramonte teacher abuse scandal and for requiring administrators to sift through every allegation. He tried to get consensus on applying for a $40 million federal grant (the teachers union wouldn’t sign on). But most importantly, he is focused on kids — and he’s getting results in the classroom. Under his guidance, more students are learning and they’re learning more: even during the worst school budget crisis its history, the district has made substantial improvements in student achievement and seen a sharp decrease of suspensions. So even though the teachers union may be itching to get rid of him, the candidates who are union-backed may want to be, well — more discreet, for fear of alienating parents and voters who might support him. Don’t buy it. The most important job of a School Board member in Los Angeles is to hire, supervise and work with a Superintendent — and perhaps in some cases — to fire him. It’s a job that manages a budget of $6.5 billion dollars a year, and is responsible for more than 650,000 students. Each and every one of the School Board candidates should be prepared to tell the public exactly where they stand on Superintendent John Deasy, and why.